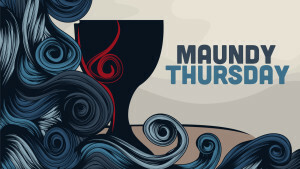 Maundy Thursday commemorates the events that transpired the Thursday evening before Easter. As the Jews of Jesus’ day reckoned a day from sunset to sunset, Jesus would have thought of these events as happening on Friday. However, as we reckon a day beginning at midnight, we consider these events as happening on Thursday. The main events occurring during these hours include Jesus’ time in the Upper Room (his teaching there and the institution of the Last Supper) and his hours of prayer in the Garden of Gethsemane. Depending on the exact time Jesus was arrested (either before or after midnight), one might also include his arrest. As the date of Easter varies from year to year, so does the date for Maundy Thursday. It falls between March 19 and April 22, inclusive. “Maundy” means “Command” and comes from the words of Jesus: “A new command I give to you, that you love one another: just as I have loved you, you also are to love one another” (John 13:34). It derives from the Latin mandatum, through Old French and Middle English. In the Evangelical Lutheran Hymn-Book the day was called “Holy Thursday.” In The Lutheran Hymnal and Lutheran Worship the day was called “Maundy Thursday.” In our current hymnal, Lutheran Service Book, it is called “Maundy (Holy) Thursday.” The use of the word “Maundy” came to us from England. In the Roman Catholic Church the name has consistently been “Holy Thursday.” Perhaps the decision to go from “holy” to “maundy” by the editors of The Lutheran Hymnal was spurred, in part, by an anti-Roman Catholic sentiment. The current trend, among liturgical churches in America, is to use the word “holy.” This is thought of as being more inclusive of the events that transpired that day. The word “maundy” tends to accent the teaching of Jesus in the Upper Room at the expense of his actions (The Lord sending his disciples ahead to find the place they would celebrate the Passover, establishing the Lord’s Supper, washing the feet of his disciples and his prayer in the garden). Because Maundy (Holy) Thursday commemorates events that basically took place after sunset, and therefore happened on Friday from a first century Jewish way of reckoning time, it is considered the first worship service of the “Holy Triduum.” “Triduum” means “three days.” These three days are also called the “Easter Triduum” and the “Paschal Triduum.” All worship services conducted from Maundy (Holy) Thursday through Easter are considered one continuous service. Therefore there are no closing benedictions at Maundy Thursday or Good Friday services. Because an Easter vigil service is conducted after sunset, it is considered the first Easter service and therefore has a benediction. Most churches will celebrate the Lord’s Supper in a Maundy Thursday service. Some will also have a foot-washing ceremony. Other will reenact a Passover meal which will include a celebration the Lord’s Supper. Our Lord’s teaching is mostly found in the Gospel of John (John 13-17). Because these events happened on Good Friday, from a first century Jewish perspective, some churches celebrate these events in a Good Friday service. At Our Redeemer we will have a special Maundy (Holy) Thursday service where we will be blessed to receive our Lord’s life-giving body and blood in the sacrament of Holy Communion. The service will end with a “stripping of the altar.” The service will begin at 7:00 PM. Prayer: O Lord, in this wondrous Sacrament You have left us a remembrance of Your passion. Grant that we may so receive the sacred mystery of Your body and blood that the fruits of Your redemption may continually be manifest in us; for Your live and reign with the Father and the Holy Spirit, one God, now and forever. Amen.